Usando simples objetos cotidianos e incorporando pequeñas piezas industriales, Zimoun construye estructuras sonoras, explorando los ritmos mecánicos y cadencias. Construcciones minimalistas en las que hace uso de la repetición de elementos ordenados cuidadosamente en retículas y cajas, generando tensión y rompiendo la armonía al añadir movimiento, reverberaciones eléctricas, aire y sonido. Artista autodidacta, ha presentado sus trabajos individuales y colectivos en Europa, América, Asia y África. Entre las más actuales: Bitforms Gallery (New York), Galerie Denise René (París), The John and Mable Ringling Museum of Art (Sarasota FL, USA), Contemporary Art Museum MNAC (Bucarest, Rumanía), Swissnex, Gray Area Foundation for the Arts (San Francisco), Lydgalleriet (Bergen, Noruega), Kunsthalle Luzern, Forum für Neue Musik (Suiza), Mois Multi (Québec, Canadá), ART 42 (Basel, Suiza), Kunsthalle Palazzo (Suiza), David Winton Bell Gallery (USA). Ha realizado talleres, lecturas y presentaciones, incluso performances, en la mayoría de los destinos donde ha mostrado su obra plástica. Using simple and functional components, Zimoun builds architecturally-minded platforms of sound. 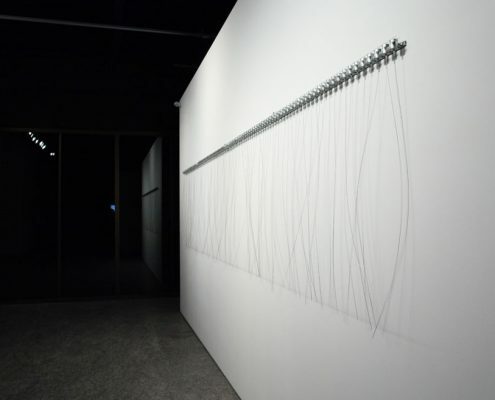 Exploring mechanical rhythm and flow in prepared systems, his installations incorporate commonplace industrial objects. In an obsessive display of simple and functional materials, these works articulate a tension between the orderly patterns of Modernism and the chaotic forces of life. Carrying an emotional depth, the acoustic hum of natural phenomena in Zimoun’s minimalist constructions effortlessly reverberates. Zimoun is a self-taught artist based in Bern. His work has been presented in solo and group shows as well as performances in Europe, North America, Asia, Africa and South America. Zimoun has been awarded different art prizes and residencies and has served as a guest lecturer. Recent displays of his work include exhibitions at the Nam June Paik Art Center in Korea; the Kuandu Museum of Fine Arts, Taipei; Art Basel; Galerie Denise René Paris; the Ringling Museum of Art, Florida; bitforms gallery New York; Kunsthalle Bern; Kunstmuseum Liechtenstein; the Contemporary Art Museum MNAC Bucharest, among others.